In the dense jungle canopies of Central America and the Yucatan, much of what remains of the Maya civilization remains hidden from view. While important archaeological sites have been discovered and are now iconic tourist destinations, an understanding of how the Maya used the land – the extent of their settlements, the organization of towns and spheres of influences – is yet unknown. Currently, remote sensing technologies that can see through the thick canopy exist, but they are prohibitively expensive. Fortunately, the convergence of aerial drones and light-weight advanced sensor packages such as LiDAR, have just now opened the door to creating the disruptive technology needed to explore the hidden secrets of the Maya. One goal of this project is to assemble a remote sensing device using drone technology for the jungle. Already discovered Maya ruins are hidden under dense jungle. 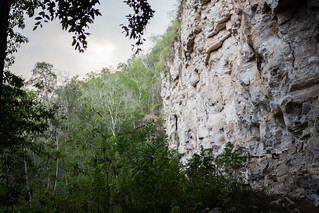 As a consequence, many sites that are not popular tourist destinations, yet instrumental in understanding Maya culture, are seen by very few people. Items found during excavation are typically claimed for preservation in museums. Large exhibits such as temple structures, by virtue of being buildings, cannot be demonstrated to a wider audience. Our goal is to change how archaeological finds are shared by exploring digital methods for documentation and visualization. Aerial Surveys: To fly a drone over the jungle and use LiDAR technology to map the terrain. Tunnel Mapping: To build prototypes of hand-held 3D scanners to generate 3D models of tunnel excavations of ancient Maya temples. Virtual Reality Visualization: To create a immersive visualization of digital models of archaeological sites and artifacts. The Tunnel Mapping project aims to lower the cost of digital documentation by experimenting with data collection methods. These methods include stereo-panoramic cameras, LiDAR, and experimental remote sensing systems based on the Microsoft Kinect camera or the Google Tango tablet. In prior expeditions to Guatemala, we brought a ground-based LiDAR system for high resolution scans of these large excavated temples. One method we are particularly excited about is Structure from Motion (SfM), a low cost technique for generating 3D models using photos from a traditional camera. This group is seeking highly motivated individuals to build data collection infrastructure for expeditions. Below, is a fly-through video created from a composite point cloud generated from 50 LIDAR scans. This video is of a point cloud generated by taking pictures of a stucco mask inside of an excavated temple on the site. The Guatemala project is a collaboration between several organizations, Jason Paterniti (GEOS), Tom Garrison (USC), Edwin Roman-Ramirez (UT Austin), Ryan Kastner, Albert Lin and Curt Schurgers (UCSD, E4E, QI, NatGeo). The project started in 2014 with two expeditions to Guatemala. 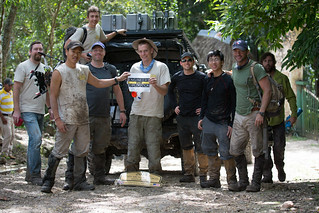 Albert, Ryan, Curt, Perry Naughton, Eric Lo, and Dominique Meyer, traveled to Guatemala in February to evaluate Quadcopters as a method of surveying jungle-bound archaeological sites. 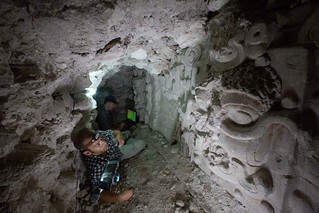 The second expedition, in May, focused on data gathering and survey techniques in several archeological sites, some of which contained Maya tombs. Curt and Ryan returned to Guatemala, and brought Dustin Richmond, David Dantas, and Sabrina Trinh. In June 2016, PhD student Quentin Gautier focused on testing remote sensing tablet technology, and in June 2017, Curt, Quentin and PhD student Peter Tueller went to the field to test a prototype of portable 3D scanner to collect data in the archaeological excavations. You can also join our Google Group to get involved.